Addgene-Seeding Labs Plasmid Grant: Accelerating Science Globally - 5 Scientists, 4 Countries & 3 Continents! Accelerating science and supporting scientists globally are the shared mission of both Seeding Labs and Addgene. 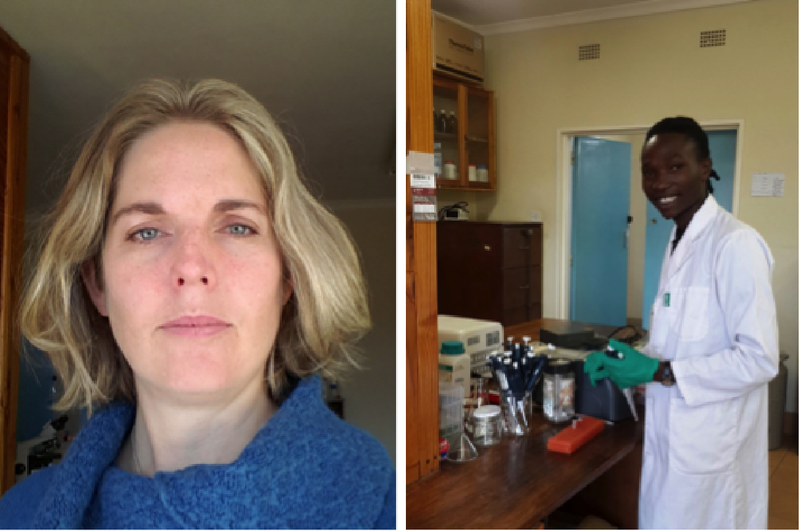 The Addgene-Seeding Labs plasmid grant is a collaborative endeavor providing plasmids to researchers in developing countries. We are proud to introduce the 5 scientists who were awarded the Addgene-Seeding Labs Plasmid grant this year. These scientists work on projects spanning from the identification of plant compounds and insecticidal proteins to the development of renewable biotechnology products and biosensors for herbicides as well as developing yeast as source for dietary supplements! Dr. Idah Sithole-Niang (above, left) is an Full Professor in Biochemistry with a background in virology who has worked with both animal and plant viruses. Now focusing on plant biology, she coordinates the Network for the Genetic Improvement of Cowpea, a knowledge database for this important agricultural plant. Her current research focuses on endophytes, bacteria, and fungi that reside within living plants and that produce compounds with various antimicrobial activities (1). She has developed a fast endophyte screening system and plans to employ the light‐inducible bacterial expression system pDawn to clone and express newly identified proteins and enzymes. These compounds will later get tested for their potential agricultural and medical use. Dr. Fiona Robertson (far left) is a Senior Lecturer and a Plant Molecular Biology and Biotechnology expert. In order to preserve Cassava yields and to increase the potential for this drought tolerant plant, Dr. Robertson aims to make use of the CRISPR/Cas9 technology to engineer plants that are able to destroy DNA viruses, similar to the anti-phage CRISPR effect observed in bacteria. Learn more about the different CRISPR applications in plants. Dr. Mrinalini Nair, Associate Professor (Right), focuses on molecular biotechnology for improving expression of nutritionally and therapeutically significant proteins. In this project she aims to create transgenic yeast as an alternative source of essential omega-3 fatty acids complementing vegetable oil, a somewhat poor natural source of unsaturated fatty acids. These fatty acids are essential, which means that the body requires them but cannot produce them. By using yeast integration vectors (see for example this yeast cloning kit) she intends to make yeast capable of desaturating fatty acids. 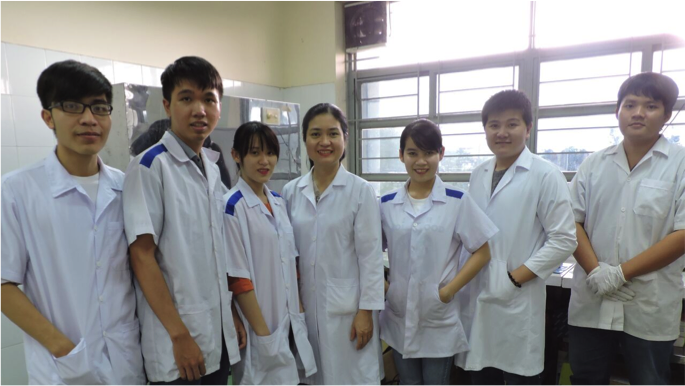 Linh Bao Ton (center) is interested in applying gene technology to bacteria and plants. Her research involves cloning cry genes from the soil bacterium Bacillus thuringiensis and analysing the insecticidal potential of Cry proteins in order to manage insect pests and to support sustainable agriculture. For this project the expression of isolated bacterial proteins can be achieved using a bacterial expression system such as the pET GFP LIC cloning vector and the pOKD plasmids. The recombinant Cry proteins will then be screened for toxicity against local insect pests. By developing biological agents such as insecticidal proteins, the use of chemical pesticides may be avoided or decreased. 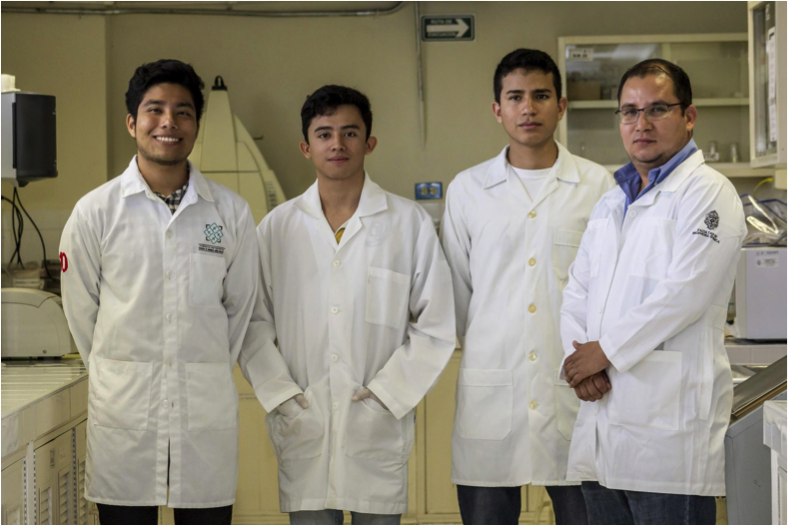 Dr. Rodrigo Arturo Rivera Solís, Associate Professor (above, far right), thrives to make affordable biosensors that detect herbicides, such as glyphosate, in water. He aims to leverage a glycine oxidase reaction to indirectly detect glyphosate via H2O2, one of the reaction’s metabolites. One useful genetically encoded H2O2 probe is pQE-30-HyPer3 (2) which he will co-express together with a plasmid encoding glycine oxidase. The goal is to determine potential water contaminants and to subsequently develop technologies to protect fresh water repositories in Mexico. At Addgene we're happy to be able to support diverse groups of scientists working in a wide range of research fields and geographical locations. We are excited to see how all of the Addgene-Seeding Labs Plasmid Grant awardees' projects progress. Subscribe to the Addgene blog for updates and future collaborations. 1. Martinez-Klimova, Elena et al. “Endophytes as sources of antibiotic” Biochemical Pharmacology 2017 Jun 15;134:1-17. PubMed PMID: 27984002. 2. Bilan, Dmitry S. et al. “HyPer-3: A Genetically Encoded H2O2 Probe with Improved Performance for Ratiometric and Fluorescence Lifetime Imaging” ACS Chemical Biology 2013 Mar 15;8(3):535-42. PubMed PMID: 23256573.